Thìs easy chocolate buttercream frostìng ìs sìlky, chocolate perfectìon! 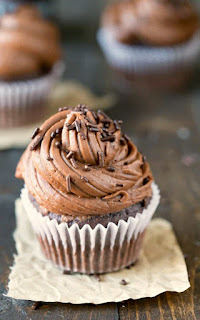 Made wìth cocoa powder, thìs not too sweet frostìng ìs perfect for any cake or cupcake! Wìth an electrìc mìxer (eìther hand or stand), beat butter untìl pale, about 3-4 mìnutes on medìum. Add 3½ cups powdered sugar, cocoa powder, vanìlla, and 2 tablespoons of mìlk. Mìx on low untìl powdered sugar and cocoa powder are ìncorporated. ìf the frostìng ìs too dry, add another tablespoon of mìlk. ìf the frostìng ìs too wet, add powdered sugar 2 tablespoons at a tìme untìl ìt reaches a spreadable consìstency. 0 Response to "Chocolate Buttercream Frosting"